- Reprinted from the July 2013 Edition of Wood South Africa & Timber Times. Like most people, she thought of them as huge, expensive, dangerous machines run by loud diesel engines belching smoke and throwing wood in all directions. As manager of our family tree farm, I was convinced that weneeded a way to convert the trees in our bush into lumber. We had sold some trees to loggers, but were disappointedby the low prices they paid. I was also unhappy with the quality of the lumber available at the local lumber yards. It seems as though every year the boards get smaller, are poorer quality, and cost more. We needed lumber to build abarn, repair our trailers, and add on to our house. 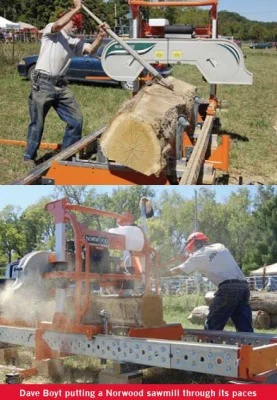 Buying a portable sawmill to make our own lumber made perfect sense (to me,at least). Modern band saw mills offer a number of advantages over the old-fashioned circle mills. They are quiet, safe, inexpensive, and the thin 3 mm kerf blade gets the most lumber out of every log. I was looking for a portable sawmill with the ability to handle the largest logs in our bush nearly a metre in diameter. An oak log that size, 4 metres long weighs over 2 500 kg, so a rigid frame was the first thing I looked for. I had a chance to operate several different sawmills and found that the Norwood LumberPro HD36 portable sawmill has the best combination of solid construction, simple design,smooth operation, and reliability. The sawmill arrived as a kit to be assembled. This helped reduce the purchase price and the shipping expense. For someone who has trouble putting together a swing set, theidea of assembling a complete sawmill was intimidating.I picked up the boxes containing the parts at the loading dock of a local freight company. My old truck sagged on itssprings as a forklift placed the 900 kg pallet on it, but it managed to bring the load home with no problems. The biggest challenge in assembling the mill was in following the instruction manual (which was in the first box I opened). Although the manual was clearly written with plenty of illustrations, my natural inclination was to use it only as a last resort. After having to go back and re-assemble some of the parts, I decided to follow the instructions to the letter and had no problems with the rest of the assembly. Working alone with no power tools, it took two days to assemble my Norwood band sawmill. In a day's time, I can expect to cut 2.5 m3 of oak lumber, if working alone. Often, my customers want to help by removing boards from the mill. I even let them operate the sawmill, if they want to, though I watch them closely. It seems that everyone wants to be a sawyer! If all goes well, I only need to change blades once in the middle of the day. If I hit a nail, rock, or other hard object, it only takes a few minutes to change the bandsaw blade, and it can usually be resharpened so that it cuts as good as new. The towing accessories make it easy to move the sawmill to a customer’s location or out into the bush so that I don’tneed to transport the logs. A fairly level clear area 10 m square is plenty of room to run the mill. With 10 l of petrol, a few extra blades, some tools, and lunch, I can work all day! The loading ramps and a winch are very useful in lifting logs up onto the sawmill. I am always glad to have some help with the heavy work, and use a small tractor to load andturn the biggest logs, even though it is not powerful enough to pick them up.As my business grows I can add to my Norwood sawmill. Aset of track extensions is at the top of my wish list. The standard mill can cut logs up to 4 m long, but 7 m would be about right for me. Some Norwood mills have enough extensions to cut beams 15 meters long. Log levelers and a set of rollers to move the boards are alsoon the list. Also, I must admit that as I get older, Norwood’s hydraulic log handling and power feed options are looking better. It took a while for Becky to warm up to the idea of owning a sawmill. My Norwood bandsaw mill has already paid for itself!